Exotic oil for massage or bath. A balanced blend of pure virgin coconut, macadamia, sikeci and dilo nut oils form a unique bio network that promotes cellular renewal for younger looking skin. Exotic oil for massage or bath. 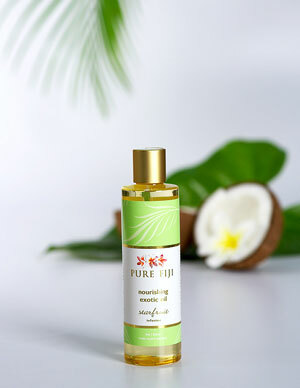 A balanced blend of pure virgin coconut, macadamia, sikeci and dilo nut oils form a unique bio-network that promotes cellular renewal for younger looking skin. Deep moisturising properties will leave your skin glowing. Use daily after bath or in the bath or as a treatment for dry hands and feet!